We love a bit of off grid camping and the need for a portable toilet is essential to make this work, so we were delighted to be asked to review the Kampa Portaflush 10 priced at £64.99 inc VAT. The Kampa Portaflush 10 is ideal for use outdoors and indoors and perfect for camping, motorhoming and caravanning and at just 31.5cm high is one of the most compact around. The Kampa Portaflush 10 is an adult size but compact, portable toilet that flushes just like a home toilet, and is ideal for camping, caravanning and campervans. 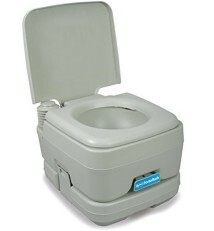 The portable toilet holds a 12 litre fresh water capacity and provides up to 50 flushes before needing to be emptied. The Kampa Portaflush 10 features an attractive matt finish that hides scratches and marks and the double sealed valve protects against leakage and odours. Other features include corrosion resistant side latches, one piece construction tanks, easy to empty spout and discharge vent and is made from a thick wall construction the portable Kampa 10 is and built to last. This easy to use and empty Kampa Portaflush 10 is perfect when going away exploring the great outdoors and want that extra home comfort of a nice toilet. The Portaflush came nicely packaged and the box is strong, so it can be kept for when the toilet is transported to offer it extra protection. 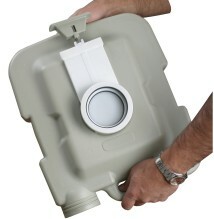 The Portaflush comes in two sections, the fresh water flush tank and the waste tank. The fresh water tank holds 12 litres and the waste tank holds 10 litres on the model we got sent - to first set it up you simply pop the two clips, one on each side of the toilet, and the top section lifts away. 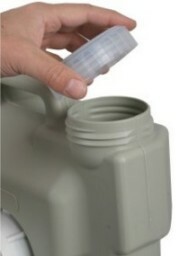 You can then fill the freshwater tank to the top and add the required about of toilet chemicals if you wish to. In the waste section I added a little water, around 1 litre, and also put in the waste tank chemicals. This tank will of course then fill up to it's limit whilst it is being used and flushed. There is no waste water level indicator, however all you need do is take a quick peek when flushing and you will soon get an idea as to the level of the tank. We filled the top tank and bottom tanks to the max when testing and swung them about and carried them in different ways and no water leaked, which is a must for when moving around a site to empty the waste and fill the fresh tanks. One of the big selling points of this toilet is that it is a low unit, measuring just 31.5cm high. We found this fitted perfectly under the rock and roll bed in the campervan and makes it easy to store when in the campervan without getting in the way. We found, depending on your type of furniture, it was able to be used in situ, or you can simply pull it out and place in your awning, toilet tent, etc. The waste tank emptying hole is of a large size and makes it easy to empty in the chemical disposal points, and also makes it easy to get a hose in there for a quick swill around and clean up, before getting it ready to use again. The flush is a simply set of bellows and we found the pressure more than adequate and perfectly up to the job of flushing. The Kampa Portaflush also comes in a 20 litre version, this one is taller at 42cm, and may be more suitable for a family who need the extra capacity. Overall this is a great unit and is strong, robust and is ideal for anyone who camps at festivals, or for anyone touring who needs access to a toilet in places where facilities may be limited. 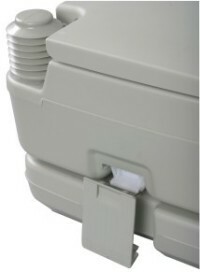 As mentioned above it should prove really popular with VW campervan owners, as the diminutive size and height means it will fit under most rock and roll beds, or can be set up in the connection tunnel of a drive-away awning (by the sliding door) - an ideal position for a camping loo. Win a Kampa Portaflush 10 Portable Toilet! We've teamed up with Kampa to give you the the chance to win a Kampa Portaflush 10 Portable Toilet worth £64.99. To find out more and for your chance to win, click here - competition now closed! I can see the benefit of the double sealed valve to ensure no odours (or anything else) leak out. However the review mentions that the tanks benefit from one piece construction and - as I have never owned a product like this before - wondered what that brings to the party since it isn't made clear. Do other portable toilets have to be disassembled and cleaned out, or is there a danger of spillage through the seams, or what? Yes, one piece tanks just means there's never going to be any potential for leakage through seams, and makes them stronger. Thanks. Are these practical to take canvas camping then ? My teenage son & I like to pop off together for odd weekends but he hates the prospect of going to toilet blocks if nature calls during the night, usually because they are at the other ends of the sites. Yes, definitely, assuming you have space to put one in your car / tent. I personally use a separate toilet tent (eg like this) , but if you're not shy you could just pop it in your main tent somewhere or a spare bedroom inner if you happen to have one! We used to have one of these when tent camping. I wanted something for emergencies/nighttime but didn't like the idea of a bucket or something you had to empty every day. The Portaflush worked really well and didn't take up too much room in the car because its fairly small.